My mom and mother in-law have something in common. They both like to cook traditional snacks. One example is Cucur. 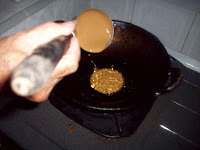 It's a famous snack in Manado [North Sulawesi], I'm dedicating this post to them both. I made some once - in their absence - and was embarrassed to tell them that I failed. 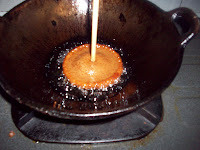 When I reported my result to them,they said it's always like that with Cucur, the most important ingredient is luck. Oh...I laughed ... But then my efforts did not go unrewarded, hubby and children polished off my misshapen Cucurs...they said it was great LOL! cooking - will probably chuckle if she reads this ! ]. Boil 400ml of the water and melt all the brown sugar in it. 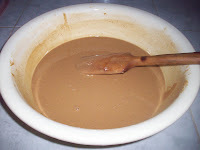 stirring, then add the rest of the water [400ml]. Stir slowly till even [pic3]. Ok now you are ready to fry it. Heat about 1 cup of cooking oil [palm oil here]. 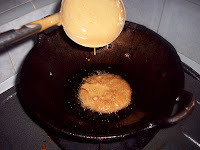 Pour in about half a cup of the batter - using a ladle- into the oil [pic 4,5]. 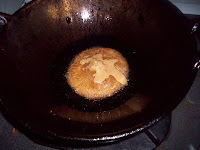 Wait until the Cucur raises and a little of the batter leaks out from the middle [pic 6], then flip it over. 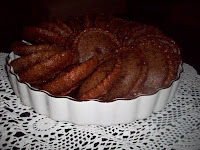 The fringes of the Cucur will begin to scallop or look like lace, the color becomes brown and it will smell heavenly ! with the Cucur at the end of it. Put it on the napkin lined tray,wait till most of the grease has been absorbed by the napkin and the Cucur cools and it's ready to be eaten. 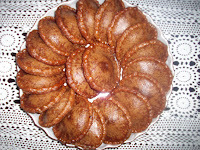 Oh yes the ingredients above is for 40 Cucurs [hehe we have a meeting at our house later]. Oh Hyds...there's on we make from sweet potatos...with brown sugar in the center. It's called Binyolos. Oh dear, Anonymous...thank you for calling me smart...though I don't know who I'm thanking. Actually I'm only smart on reporting...I didn't make it ...only took pictures...then gobbled up the cucur LOL ! Lho...lupa nama sendiri yaa ??? Nice to see you always !